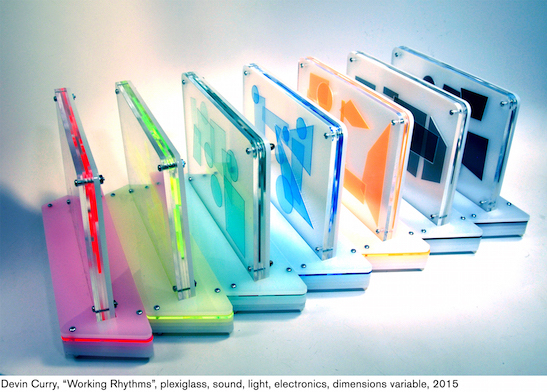 REVERSE is pleased to present WORKING RHYTHMS, an interactive music installation by artist Devin Curry in which visitors play and mix rhythm bases and sound loops by manipulating different sonic sculptural objects. The eight sculptures and their loop-based musical accompaniments reference eight New York City public locations frequented by the artist during his regular routine. Each object’s unique geometric design represents an abstract sketch of a specific location. An audio and visual abstract portrait of the common urban spaces that New Yorkers share, WORKING RHYTHMS invites listeners to actively engage with an original composition of electronic beats made from field recordings of public places in New York City. The installation consists of eight digitally fabricated sculptures that can be arranged and rearranged on platforms to control musical loops in real time. Each of the sculptures contains six unique loops that play depending on which platform the object is placed upon. The platforms also enclose LEDs which illuminate the sculptures in different colors. Micro-edited field recordings of the locations form the sonic palette of the music. Sampler instruments create 48 rhythmic patterns that can blend together seamlessly regardless of combination. In his compositional process, Curry draws upon his experiences as a dance music producer, remixer, and DJ to push the boundaries of genre conventions in order to document emotional connections to places and moments in time. By moving through the exhibit space and combining different sculptures with various platforms, visitors can influence the musical arrangement. This participatory interface gives users – regardless of musical background – a sense of immediacy and discovery as they experiment with physical and sonic arrangements. The installation blurs the line between listener and composer providing a dynamic, interactive remixing experience. Devin Curry is an interdisciplinary artist and electronic musician based in New York City. In his exploration of the effects of digital technology on the production and consumption of recorded music, he creates projects that allow listeners to actively engage with both music composition and the music making experience. Curry’s fascination with layers, patterns, and balance forms the foundation for both his musical and visual pieces, which document fleeting moments in the chaos of urban life. Curry has presented his work at the Museum of the Moving Image (NYC), NYC Media Lab Summit, and IAC Building (NYC). Under his alias Grand Atrium, he has released electronic music on labels Maison Kitsuné and Secretly Canadian. He received his Master’s degree from New York University’s Interactive Telecommunications Program (ITP) and his BA in Cinematic Arts Production from the University of Southern California. He is currently an adjunct faculty member at Fordham University and Queens College.